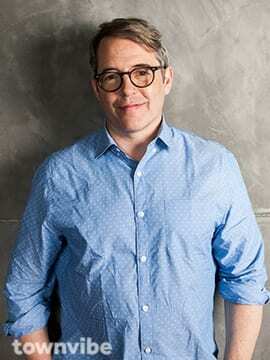 Matthew Broderick doesn’t have much downtime, he says from his West Village townhouse before another performance of The Seafarer. After Memorial Day weekend, he steps right into The Closet, which premieres June 26 at the Williamstown Theatre Festival. It’s a satire by Douglas Carter Beane about Martin O’Reilly (Broderick) stuck in a dead-end job. His only friend is his muffin-baking co-worker (Jessica Hecht) who longs for him. A stranger (Brooks Ashmanskas) drags them all out of their closet. Where will you rehearse for The Closet? We start in New York for a couple of weeks, and then I go up to Williamstown to finish rehearsals. I have to learn the lines and not forget the lines I already know for Seafarer. And not mix them—I don’t want to go into an Irish play and talk about office politics. Have you been to the Berkshires? When I was a kid, my father did a lot of summer stock—I remember Olney, Maryland. I remember Stockbridge. There’s a theater in Stockbridge, and he did a movie there, too [Alice’s Restaurant]. I remember going to regional theaters with him in the summertime. That was 45 or 50 years ago, and that’s what I’m picturing is going to be happening, but I’m sure I’m wrong. What do you expect the Berkshires to be like? Everybody says it is very pretty. I’m going to stay with Brooks Ashmanskas, who is a good friend of mine, and we’re renting a place together. We are going to be doing The Odd Couple at night and The Closet during the day, that’s our plan. Will you bring your wife, Sarah Jessica Parker, and your children? They have a lot of summer activities already that they do, so it’s not so easy to pull them out of everything, but they will definitely be here. What attracted you to take part in The Closet? I’ve just always really loved Douglas’s writing. So, that was the big thing to be asked just to do the reading of this play a couple years ago, and I just thought it was very funny. And kind of timely. Part of the play is about political correctness, and people having trouble expressing what they mean. What’s your impression of Martin, the main character in the play? He is in a very precarious point in his professional and personal life. That is the start of the story, and then he has no relationship with his son. He is quite miserable, actually. So, what happens in the play, he sort of figures himself out and gets himself going again. Everybody in the play finds themselves? It is nice in that way because it is old-fashioned type of play, where everything is a total jumble, a mess, and how it is going to work out, and somehow it does. So it should be a very good feeling when that happens. When a farce works, the feeling is, oh my God, how did that all come out in the wash? But it did. Where are you most comfortable—stage or screen? I can like or hate either of them. I mostly love them both. Lately, I have spent a lot of time in the theater. And there is something very satisfying about that because, for the usual reasons. You get to do the whole thing. Nobody’s editing it and you are really in control of the timing, that is something really nice for an actor. On the other hand, I really love the intimacy of a movie or television, that a camera can be two feet from you. What films are you most proud of? I just did a movie I really like called To Dust that hasn’t come out yet that I just saw at the Tribeca Film Festival, and I thought it was very good. I like Election, I like Max Dugan Returns, which was my very first movie. I like Ferris Bueller, of course, because everybody likes that. How often do you get “Hey Ferris”? I don’t really get that very often, but I get asked to sign Ferris Bueller paraphernalia quite a bit. I come out of the theater and they have stacks of pictures of Ferris Bueller, different objects based on the movie that they want me to sign so they can sell them. It’s really fun, it’s really neat. … I’m joking. How often to you get to the theater? Lately, I cannot see anything because I am in something. I cannot wait to see Angels in America. The last thing I saw on Broadway, I think, was Hello, Dolly. I have seen both versions of that, which are both spectacular. And I really, really want to see Bruce Springsteen. And there is a Bob Dylan musical coming, too, that I want to see. What are things you haven’t done that you would like to do within your profession? I just want to do good things, really. That is the sort of boring truth. I feel that I haven’t done some classics, really ever. Some day it might be interesting to do something like that. Where are you now, and can you describe your day so far? I try to keep my days simple when I have a show, but I cannot always. Today I went to the gym, I ate, and I called you. And my son just came home, and I have to have a conversation with him. That is my life. It’s not terribly interesting. I am in my townhouse. There is a dog here and a cat. I am pacing in the living room. I am on a portable phone and I am wandering around the room, looking out the window. It looks like it is going to rain. People are wearing T-shirts, they look hot. There is a lot of green, pollen-y-type stuff on the ground. I think it is going to be allergy time.